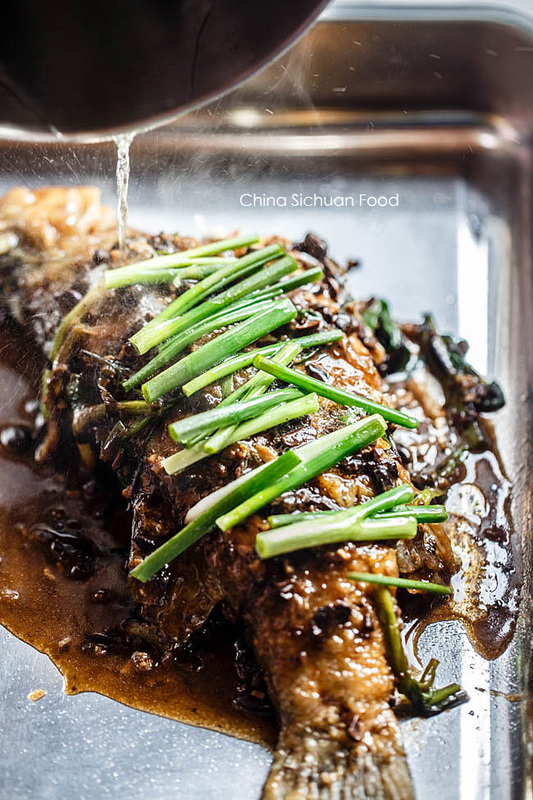 People in Sichuan province are great at making yummy fish dishes using very common ingredients and seasonings. The most popular one might be red braised fish (红烧鱼). I have a small girl who loves all types of fish dishes but has little tolerance to chili peppers. So this is a dish developed for her. Rich in flavors but do not spicy at all. Another children friendly fish dish is sweet and sour fish (糖醋鱼). I have made my small bottom of homemade black bean sauce. If you are a fermented black bean lover, I strongly you prepare a small batch. It can shorten your preparing time and enhance the flavor due to the long time combination of flavors. 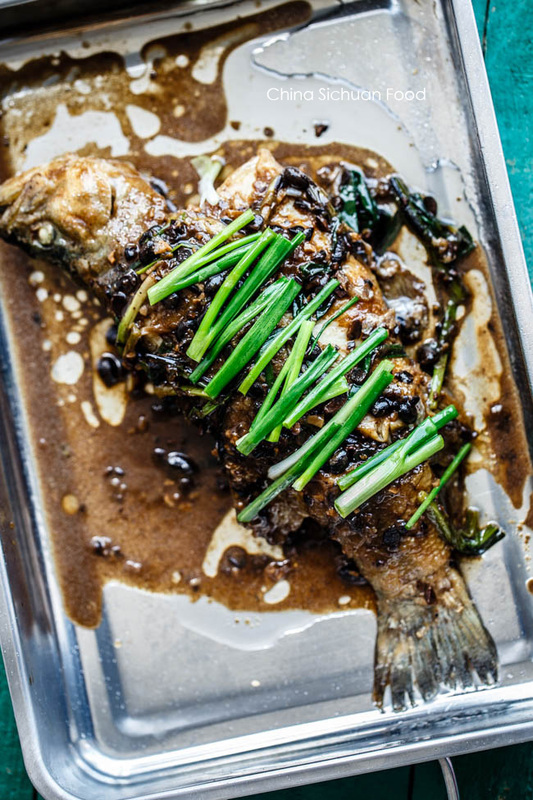 Make 2-3 cuts on the thickest meat of the fish and marinate with salt and several pieces of ginger. 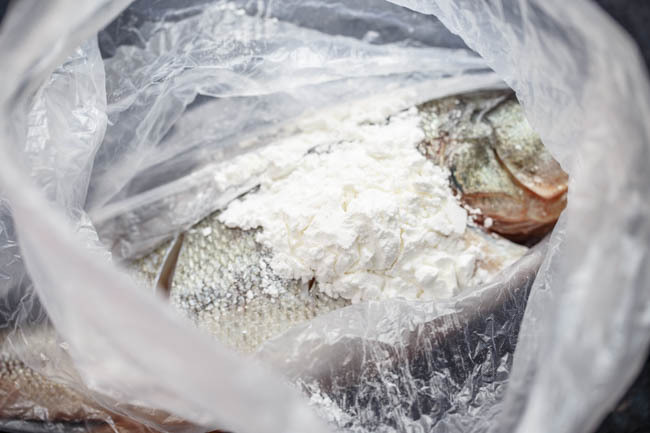 Transfer the fish to a plastic bag and add 1 tablespoon of cornstarch. 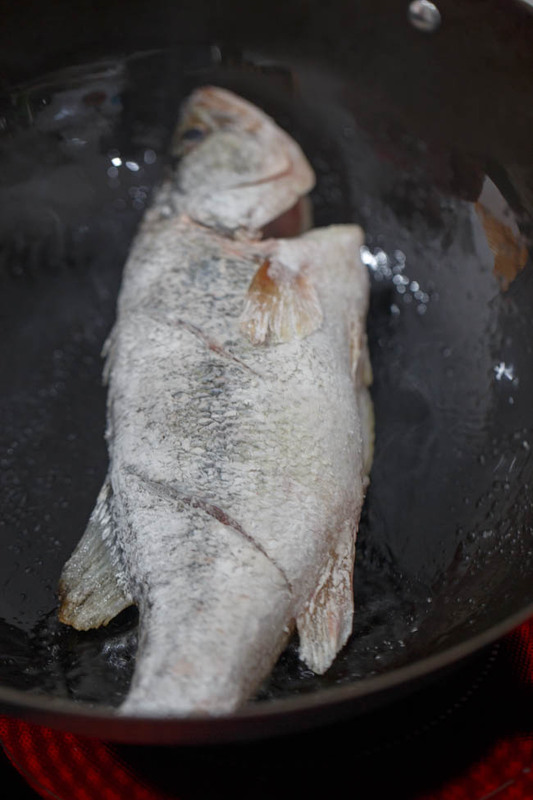 Shake the fish gently until the fish is well coated. Heat the wok or pan firstly and then add oil. Heat oil until almost smoky. Place the fish in. Let is stay for 1 to 2 minutes over medium fire (you can gently push it to avoid sticky to the bottom ). Then turn over the fry the other side. Clean the fish and cut several cuts on the thick part of the fish meat. Drain completely.Marinate with a small pinch of salt and 3-4 slices of ginger. Set aside for 10 minutes. 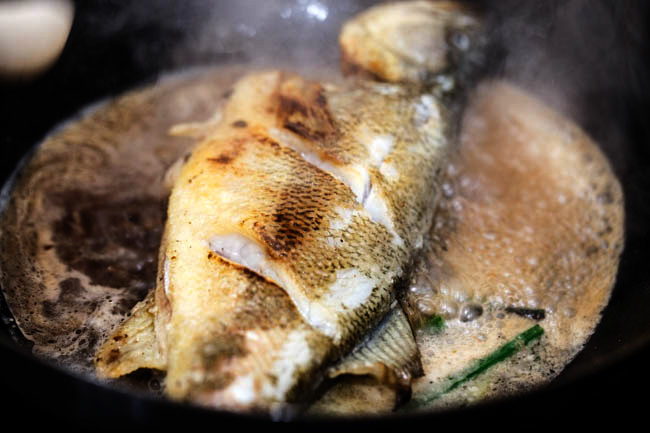 Coat the fish with a thin layer of cornstarch. The easiest way for an evenly coating is to use a plastic bag. 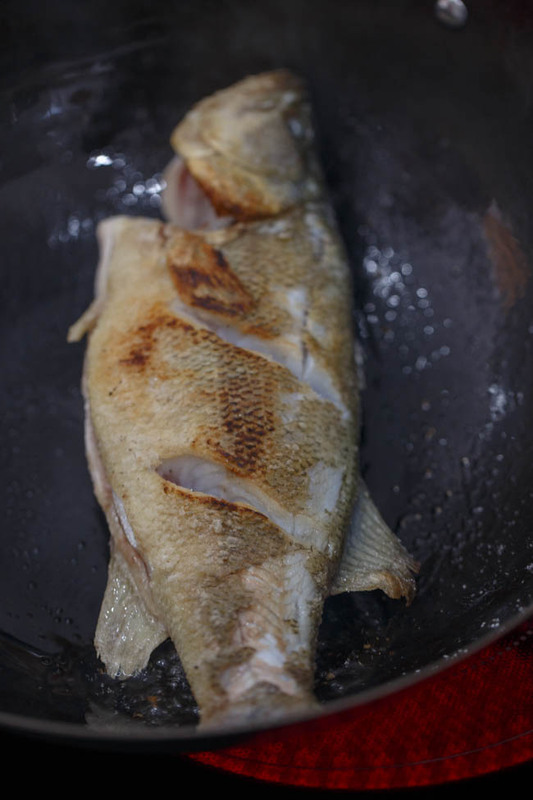 Heat around 3 tablespoons of cooking oil in a pan and fry the fish until crispy on both sides. Place on side down and let the fish stay for 3-4 minutes over slow to middle fire. Then turn over and fry the other side. 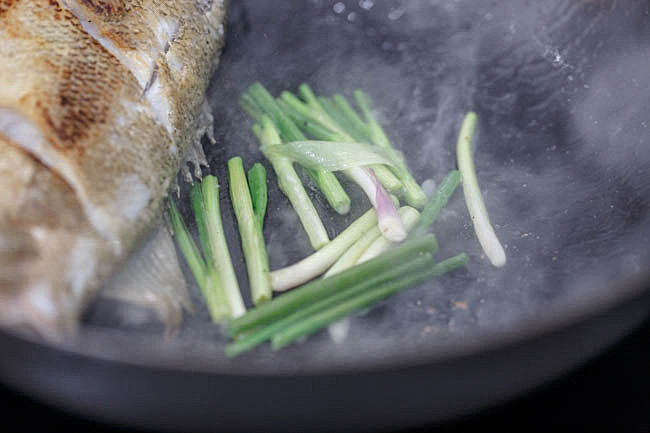 Move the fish to one side of the pan and fry half of the scallion until aromatic. Place black bean sauce, water or stock in. Simmer for 3-4 minutes and slightly turn up the fire until the sauce is almost thickened. Add sections of 2 scallions and then heat around 2 tablespoons of hot oil. Pour the hot oil over the scallions. Clean the fish and cut several cuts on the thick part of the fish meat. Drain completely. Coat the fish with a thin layer of cornstarch. Marinate with a small pinch of salt and 3-4 slices of ginger. Set aside for 10 minutes. 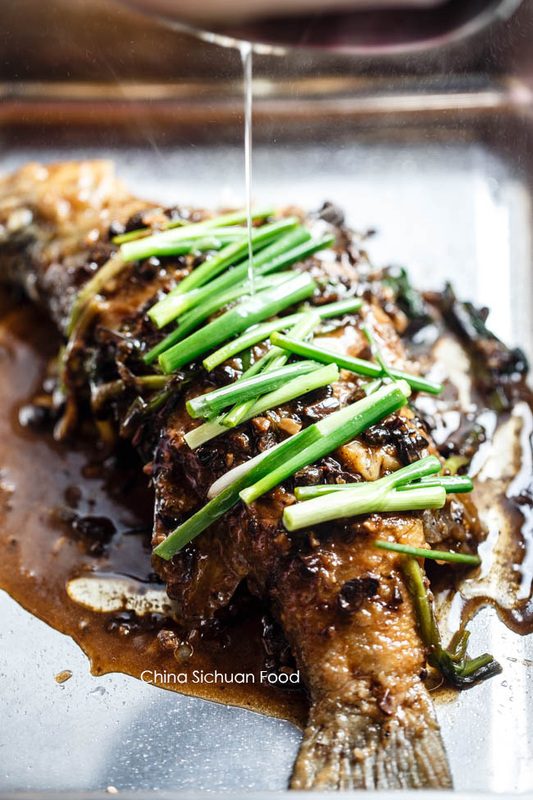 Move the fish to one side of the pan and fry scallion until aromatic. Place black bean sauce, water or stock in. Simmer for 3-4 minutes and slightly turn up the fire until the sauce is almost thickened.